Following in the footsteps of Reese Witherspoon and Bruna Papandrea’s Pacific Standard Productions, and Lena Dunham and fellow ‘Girls’ showrunner Jenni Konner’s ‘A Casual Romance’ production company, Aussie actress Rose Byrne is the latest woman in film to firmly stake her claim in wanting to add to the female narrative in a big way in Hollywood. To put this into perspective as to why this is even newsworthy, an industry study released in 2013 stated that women make up a mere 16% of directors, writers, executive producers, producers, editors and cinematographers working on the top 250 domestic grossing films that year. To break it down a little more, women only made up 6% of directors, 10% of writers, 15% of executive producers, 25% of producers, 17% of editors and 3% of cinematographers. When you realize the fight women have got on literally every front in Hollywood, like us you would no doubt get excited to hear women women like Rose, Reese, Lena (and here’s hoping many more) will start to recognize they power they could take back by creating their own production company. Together with 5 other Australian filmmakers, Rose has launched The Dollhouse Collective production company. “We come together under one roof. Five female filmmakers committed to exploring the creative boundaries of film, TV and theater. We champion change, we value relationships, we advocate artistic collaborations. We are risk takers, friends and passionate story tellers,” says their website. The company is based out of Sydney, Australia and will no doubt start to have a major impact on the film industry there, with the 3 projects they already have in development. “The core aim is to develop theatre, film and television together and tell stories with a strong female presence. This formalizes what we are already doing. Sitting around the dinner table we have always been sounding boards for each other,” director and writer Gracie Otto told Screen Daily. Rose told Elle magazine that it was a recent burst of feminist inspiration that got the wheels turning about wanting to start her own company. She also said that after many conversations with the other 4 women who are all friends, they wanted to create an avenue to produce their own projects. 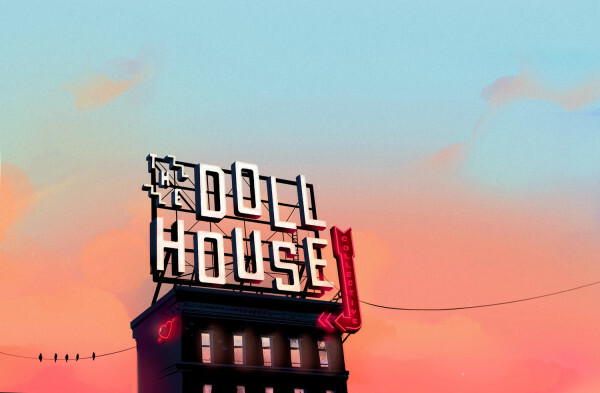 The Dollhouse Collective will not just be limited to female stories only, however that will be a huge aspect of what they do. “I feel like there’s more of a conversation about it. But Rome wasn’t built in a day so these things take time. The roles for women on television have historically always been stronger and that, I would say, is still true. The question is commerce. That’s probably where there’s a block for a lot of people, the commerce behind it. Where is the audience? And it’s so clear to me that there is a huge audience for female-driven projects. People still seem to think it’s a fluke when it happens. That’s one of the hurdles that’s still left to be jumped over,” said Rose about why the timing is right. With the huge success of films like ‘Bridesmaids’ of which she is a star, as well as female-driven action blockbuster franchises such as ‘The Hunger Games’ and ‘Divergent’, the excuse of anything being a “fluke” is just bogus to us these days. “Women watch plenty of television and theater. They’re consumers, like everybody else. I think that is a thing that still has to be addressed and changed,” she said. There are specific women who inspired Rose in her career and made her realize what a great opportunity she had to create a company championing the female narrative. One of those was Sheryl Sandberg, whose TED Talk inspired her, as have the examples powerful women like Arianna Huffington and Marissa Mayer have set. “I’m trying to ‘lean in’ more, to quote Sheryl Sandberg, with the more uncomfortable responsibilities that I have. I think it’s only through learning, and doing something uncomfortable, that you can actually change. I think Reese Witherspoon is brilliant. She’s so proactive and has a production company, which is producing and buying rights and is incredibly successful. She’s amazing and is also a mother. She’s incredibly inspiring,” she said. She also lists Betty Freidan, author of ‘The Feminine Mystique’ and Lena Dunham as some of her heroes. One of the feelings Rose shares with Vogue Australia in an interview about her new company is that she is tired. “I’d love to get to a day when people didn’t say ‘Wow, we didn’t know women were so funny’,” she said in reference to how female comedians are often seen or treated. We too would love to get to a day when fighting for equality was no longer needed. Until then we need women like Rose Byrne to use the amplified voice and platform she has to create opportunities for other women in the industry. And of course it is not just the film industry where women are battling for equality. It is in a lot of areas in the world. If you need any reminder of how fed up and tired we ALL are of this fight, we would like to share this hilarious video called ‘Make It Fair’ starring Rita Wilson and a slew of other female actresses who say we might as well make it fair and give 100% of everything to men. Of course it’s tongue in cheek, but the struggle is real!